Gateshead chairman Graham Wood is "actively seeking" new ownership with a view to stepping down and handing over control of the club. Wood, 71, who took over the football business in 2006, will step down at the end of June and the target is to find a new owner by May. The search for new ownership means the appointment of a successor to Gary Mills as manager will be delayed. "I feel it is an appropriate time," Wood said. 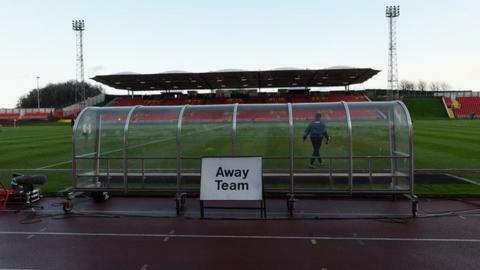 League football was a target for Gateshead under the former Sunderland vice-chairman's stewardship, as was the construction of a new stadium project. They came close to the former, losing to Cambridge in the play-off final on their maiden Wembley appearance last season, while the stadium project is yet to come to fruition. No successor will be appointed for Gary Mills until the ownership situation has been sorted. "A new owner will not only inherit a debt-free club but also a base-line of funding which is secure for next season and with potential to increase further," Wood added. "So, the foundation has been well and truly set for a new owner to build upon and continue my dream of regaining Football League status for the town following an absence of 55 years. "I advised my fellow directors of my intention to retire several months ago, since when vice-chairman, Brian Waites, and I have been seeking new owners and/or investors both at home and abroad. "We have recently been holding discussions with a potential investor and planned to make an announcement at the end of the season. However, talks are still ongoing."